Wait, what? 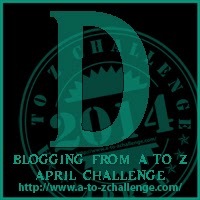 D is NOT for Flash Fiction (I can spell better than that). It's for. . . Djinn, I guess. This week's Wendig challenge involved a list of 10 random words. Our mission: to use 5 of them in a story. Here's my story. The list of words I used is at the end. (Standing warning: Wendig's blog is not for children. Also often not suitable for work. But always entertaining and often filled with great advice for writers). Gorg Trollheim took one last look back at the City of Celestial Celery. On the wall, three lumps of stone raised stone hands and waved a farewell. Gorg raised his own in return, then let it fall. Next to him, Pugrum Stonelump sighed deeply. "It is no use, my friend," Gorg said. "Daisy has chosen, and not chosen either of us." The potion Gorg had drunk hours before had sharpened his wits as well as loosening his tongue. Pulgrum had declined the enhancement, but still Daisy Basalt had chosen his younger brother Krump, less chipped and weather-worn than Gorg or Pulgrum. The two rejected suitors had left at once for the trollish homeland. Gorg liked Daisy. But with the new intelligence racing about his stone synapses, he knew he couldn't cope with love. His hand touched the flask at his belt. "Are you sure you don't want to try this stuff?" he asked Pulgrum. The big troll (bigger even than Gorg) shook his head. "Maybe sometime. See what it does to you first." Gorg smiled, cracking the stone around his mouth a little. "And they say trolls are stupid." "Not stupid. Think slow. Talk slow." It was true. Talking slowly made people assume trolls were stupid. It was an error that had cost some very bad men their lives. "Well, let's move less slowly. I want to get out of this curst farm country and into the stony lands. I'm hungry." After that, they didn't talk. Gorg had his thoughts to keep him busy. The Tongue Knotter that had loosened his speech had sped up his thinking. He was used to slow thoughts and the time to think them. He was an orphan, and had lived alone, almost as a hermit, for many years until revenge had called him into the world. Now thoughts came thick and fast, like a pack of hounds on the scent. They'd been freed from prison, thanks to the eloquence he'd gained from the potion, but Gorg wouldn't be comfortable until he was far from the castle of King Celery the Halfwit and his more intelligent (and less scrupulous) councilors. Gorg would have been happier if he could have seen the body of Duke Bale the Artichoke Hearted, whom he had followed for revenge and to protect the king. By the time he'd been let up from the dungeon, the casket had been sealed and placed in the crypt. Gorg heard some of the servants say he'd splatted so hard after his jump from the tower that they'd scarce had anything to scrape up and bury. Gorg wanted to know his enemy was dead. "I wish we were to the mountains already," Pulgrum sighed. "No dinner, no Daisy, no nothing." Gorg picked up an odd-looking white stone from the side of the road. Before he could take a bite, a man appeared in the road. "At your service and all that but please don't eat that stone," he said in a rush, trying to arrange his robes as he spoke. "Oh, blast, I messed up again." The man took a deep breath, and said in a sepulchral voice, "Djareem the Djinn, at your service, masters. Wishes granted, reasonable. . . no, wait, that's not right," he finished in the more human tone. "A Djinn," Pulgrum breathed, awestruck. "What's a Djinn?" "A fraud for fools," Gorg answered. "A Djinn is a magical being who grants wishes to whoever releases him from the vessel in which he has been held captive," Djareem said. "You have released me from that stone." "There is no such thing as a Djinn," Gorg said. He fingered the stone. Gorg and the Djinn glared at one another. "Come on, Pulgrum, let's get going." Gorg tucked the stone into his pouch. Djareem winced, and followed the trolls as they stumped off down the road. "The thing is," Pulgrum said after a mile, "maybe a Djinn could get us some good rocks to eat." "Rocks? You would call up a Djinn and ask for rocks?" After another mile, Gorg spotted a pile of stones near the road, where some farmer had cleared them from a field. They were near enough the edge of the plain now that there were stones in the ground. "See? I have produced stones for you to eat," Djareem said. "Well," began Gorg, then he stopped. They could argue later. He was hungry. He ate. Later, after they'd eaten half the rock pile, Pulgrum said, "Why are we walking? Djareem, carry us to our homeland at once!" Gorg knew that would never work. But he didn't say so. The Djinn, who could not exist, stood and looked at him. "Well? Shall I? I can do it, if you believe I can." Gorg struggled against the arguments that welled up. They didn't seem as clear as they had been, anyway. The words were leaving him. After a few minutes, Pulgrum repeated the command, and Gorg nodded. And in the wink of a (slow, trollish) eye, they stood in the rock-strewn Valley of Stone Fruits. Gorg's home. But the shift had cleared Gorg's mind again, and he looked at the Djinn. "You are not real and you cannot do that." As the landscape wavered and reshaped itself to the Plains of Fruitfulness, Djareem also wavered and faded. "I told Ba--" he tried to say before he vanished. Gorg took the odd white stone from his pouch and popped it into his mouth. It crunched satisfyingly. And he took careful note of the Djinn's last words. He didn't like that at all. He would need all his wits about him on the journey home. All his wits, and a few extra. He pulled the flask from his belt and took another sip. My five words were: Djinn (of course), casket, hermit, hound, and orphan. In further news--my low-key blog tour continues. Visit Carla Sarett for a fun interview with me! Then enter the giveaway for an ebook of Death By Ice Cream! Great story! Loved the writing. Ah, you and my Eldest Son. Cookie dough is fine, but not enough chocolate. . . Glad you liked the story. Gorg is becoming one of my favorite characters. I adore your trolls Rebecca, every time I read them. Great to see a different sort of fantasy protagonist. Aww, thanks! Garg is kind of cute, in a stony sort of way. Trader Joe's makes a killer raspberry sorbet. . .